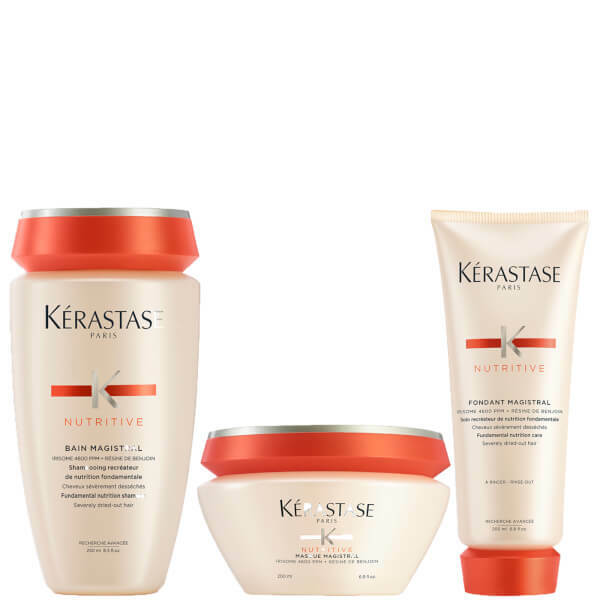 Repair and revitalise dull, dry and brittle locks with the Kérastase Nutritive Nourishing 3 Step Regime; a trio of best-selling treatments that work in perfect harmony to deliver long lasting results. Expertly formulated with complex regenerative blends catering specifically for fine and weakened hair, the regime leaves tresses looking healthier and restored. With an Irisome 4600ppm Complex, the innovative shampoo gently eliminates impurities, whilst a regenerating blend of Benjoin Resin, Ceramide and Xylose strengthens and restructures hair fibres from within. 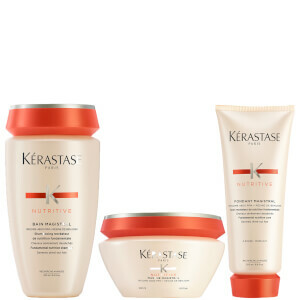 It helps improve manageability and defends against heat styling to reveal calm, sleek locks with every use. Utilising the 4600 PPM Irisome Complex and Benjoin Resin technologies, the intensely nourishing hair mask gets to work on undernourished and dried out hair; its balancing and protective properties help to smooth and soften every strand, improve manageability and detangling, and inspire mirror-like shine. With an Irisome 4600ppm Complex, the ultra-nourishing conditioner restores soft, smooth hair with a luminous shine. Formulated with the reparative blend of Benjoin Resin, Ceramide and Xylose, it strengthens and repairs hair fibres whilst improving manageability. Experience hydrated, sleek and detangled locks with a replenished sheen.